Caroline Dale has a unique distinction: currently, her fingers are more famous than her face. It’s something which Caroline celebrates and recounts with pride, because it’s only the latest instalment in an inspirational story which began many years ago. At the age of five, Caroline heard a radio recording of Jacqueline du Pre playing Elgar’s cello concerto. It inspired her, and after a year of pestering her parents, she had her own way and was given a quarter size cello. If this were to be a Hollywood movie script, there would follow a series of dissolving shots marking the passage of time, portraying a girl enjoying her childhood in a Middlesborough comprehensive, and showing scenes of intense application to the study of her chosen instrument. Then, so the plot runs, at the age of 13, the girl wins a national music competition. The woman who so inspired her, now beginning to suffer the debilitating effects of multiple sclerosis, happens to watch the televised competition, and writes her a note of congratulation and invites her to tea. Caroline moves on to study at the Royal Academy, and when she plays her debut concert in London, Jacqueline is there, prominent amongst an audience impressed by the dynamism and energy of one of the country’s most exciting young talents. Years later, when the directors of a controversial film about the life of the du Pre sisters are seeking a cellist who can provide both the soundtrack and close-up shots required, they turn to Caroline. It does sound like a movie script, and in the hands of Hollywood it would be corny as hell. But interesting and inspiring though the link with Jacqueline du Pre is, it’s just a small part of a remarkable story of a very original artist. 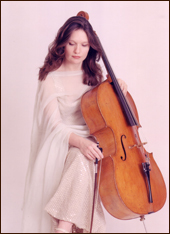 Caroline Dale is quite simply “a masterly exponent of the cello” (Daily Mail). She’s staged recitals at the Purcell Rooms, the Queen Elizabeth Hall, and The Wigmore Hall; she’s toured Canada, the States and Sweden to huge acclaim; she’s performed as concerto soloist with the London Metropolitan, the Royal Philharmonic, the Calgary Philharmonic, the Halle, the English Chamber Orchestra, the London Philharmonic and the London Chamber Orchestra. That’s the orthodox bit of Caroline’s continuing career. But a large part of her work journeys into areas which have long been considered ring-fenced against classically trained musicians and musicianship. 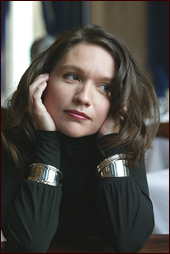 She worked with a small trio creating a soundtrack for London Contemporary Dance, under the directorship of Barrington Pheloung; she performed with Led Zeppelin at Wembley Arena, appeared with Oasis on Top of the Pops, and with George Michael on MTV; then she joined forces with Nigel Kennedy touring Europe for a series of marathon three hour concerts featuring arrangements of an explosively diverse range of musical masters, including Miles Davis, Jimi Hendrix, John Coltrane and classical quartets. Inspired by Nigel Kennedy’s simple dictum that there could and should be no barriers to the application of her musical skills, she moved on to create string arrangements for Joan Armatrading, Squeeze and Simply Red. Justin Adams says of her “She’s awesome. Whenever I’d worked with classically trained musicians before, I’d felt intimidated by all the technique, and frustrated by their inability to swing. With Caroline, that’s never been a problem. When she kicks off playing the first solo at a gig, you feel the audience melt”. Caroline’s is a career which has been marked by a wilful and hugely creative disregard of orthodox expectations. Ghostland is another step in a wild cross-genre, cross-cultural, ground-breaking approach to playing. And since Caroline says “it’s the thing I’m most proud of so far”, it’s got to be special.